Yes, this time we ARE going to the Oregon Coast! This time we are going to the beach. We're leaving tomorrow morning and will be gone until Thursday night...just a brief respite from getting ready for winter. 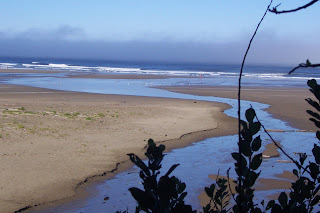 The Oregon Coast is only 1 1/2 hours from us, as are the mountains, and we've always enjoyed retreating to the coast and sometimes to the high desert on the East side of the mountains. There was a brief tsunami advisory in effect for tonight along the coast, but nothing significant. Though this is a minor event here, it will serve as a reminder of the suffering of those in Pago Pago and elsewhere in Samoa following the earthquake that hit the area. They will be in our thoughts and prayers. 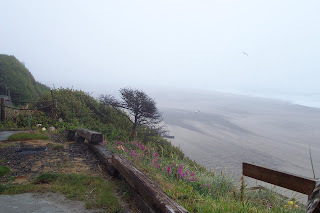 This is a photo from the deck of the motel where we stay in Lincoln City. I'll be back with some more photos and comments Friday or Saturday. Just a brief "Thank You" to those of you who regularly follow this blog. Your presence and the input I get from your sites helps keep me going. In that light, I wish good travels for "Rika", travelling from Germany to Japan. Bon Voyage. Lynn-Marie took this photo; she calls it her bio sculpture. Close enough. Use your imagination. Yesterday I said I'd try to get a photo of L. schwantesii var. marthae with the flower open. I almost waited too long as the sun was setting when I took this. The Fall flowering season is in full swing, this one being the flower of Echeveria 'Black Knight'. This one wants us to take notice! We picked up this Lithops at a small Mojave Desert nursery a couple of years ago. We understand that most variegation in lithops is short lived, but this has lasted through two growth seasons. The photo is by by wife, Lynn-Marie. And another Lithops breaks into flower. This is Lithops schwantesii var. marthae and the flower opened up more later on but I didn't have the camera. If it's still out, I'll catch it tomorrow. Another photo from earlier this year on our rather problem filled trip to the Southwest U.S. 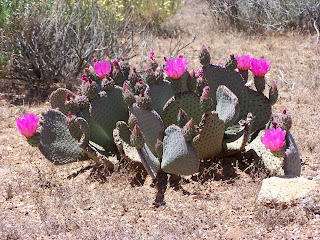 This photo of Opuntia basilaris (Beavertail Cactus) was taken just outside of St. George, Utah on our way toward Vegas and Tucson. We've seen a desert in Nevada with these flowers covering the ground as far as the eye could see. Quite impressive. This photo isn't recent, but I haven't posted it yet: Escobaria minima. I love the flower color and they're pretty hardy as well. We haven't really specialized in collecting Gasterias, but this is a nice little Gasteria variegate that I like quite a bit. Don't know it's name, if it has one. Help anyone? Another from our collection. This one doesn't flower, but it keeps on proliferating. And proliferating. 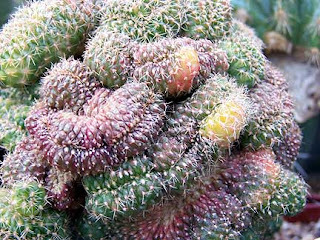 It's labeled as a monstrous form of Echinocactus grusonii, but you couldn't prove it by me. It isn't big like the "Golden Barrel", but does have some resemblance... We haven't tried it on it's own roots yet; maybe next Spring. 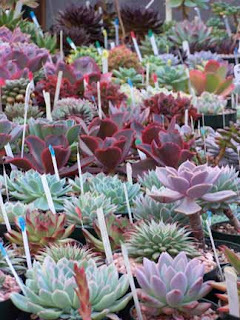 With the arrival of Fall, for those of us in the Northern Hemisphere, and especially in more northerly climes, comes the annual "adventure" of finding places in the greenhouses (and the house) for all the plants which can't take the sometimes frosty nights. This year the challenge is going to be especially difficult. Some older plants which just weren't doing too well have had to be discarded and other plants, which we have to many of, are being put on sale or offered wholesale to some local plant shops. And even then it's going to be hard to get everything in. We may be testing the hardiness of some plants we aren't too sure of! All of this means lots of lifting and moving flats and some larger potted plants. Since I wasn't feeling well this morning most of today's work fell on my partner of 41 years, Lynn-Marie. My thanks to her! Anyone want to come over and lend a hand...free drinks and possibly a gift plant for the effort! This is another favorite among our crest collection. It blooms dependably every Spring. And what's not to like about this line of flowers. Wasn't feeling good this morning so we didn't go to the coast. Will probably do so next week. In the meantime I'll continue to post. I won't be posting for the next couple of days as we're taking a couple of days off at the Oregon coast. It looks like the weather is going to be great as we're in a bit of a dry spell. This should be a good break. Back later. This is Glottiphyllum pygmaeum, one of those fat mesembs from South Africa. Someof these "Tongue Plants" can get pretty big and rangy, at least in our experience. This one tends to stay more compact and neat. These are flowering now so it's time to post it. Quite attractive I think. I'm afraid I'm too tired to post much tonight. As my profile indicates, I'm a retired United Methodist clergyman - emphasis on "retired". But I'm still invited to do things now and again. I'll be doing a baptism of a child of a child I baptized some years ago on 11 October and I'll be officiating at a worship service on the 18th. And I still worship at the church where I was Pastor for 19 years, Woodlawn United Methodist Church in Portland - a multicultural and multiracial congregation. As some of you may have surmised, I'm not aligned with the religious right in this country; I'm what I would describe as a "progressive Christian." And if I ever decide to spout off about my political or religious views, it'll be in a separate blog. That said, I'm not used to 3 1/2 hour long worship services, but I was invited to be part of the clergy celebrating a special occasion at a Black Baptist Church this morning. And though it lasted at least 3 1/2 hours, it didn't seem that long because the music was so outstanding (100 voice choir, an instrumental ensemble of drummers, violins, cello, harp, flute, saxophone, electric guitar, organ and piano, and some very outstanding soloists)! Then I came home and painted some trim on the house. I'll post more tomorrow after I get some rest! One of our crests which always surprises me when I look closely at it. It keeps changing on me. Some new variegation on a new twist or turn. Over the years we've collected a fair number of crests, variegated and monstrose plants. This is where most of the crests etc. are located in our greenhouses. Some are in desperate need of re-grafting. Some have been removed from their grafts and are growing on their own roots. In the next few weeks I'll be posting a few of these plants for your enjoyment. A bulb from South Africa, Haemanthus albiflos is certainly impressive. They're easy to grow and send up this dependable "bottle brush" type flower. It's obvious from the above photo that we have it on the same table as some of our Haworthias and an Echeveria and Sedum. And what about that flower! I've always liked these little jewels. Lynn-Marie's been growing them on for quite a while now and we'll probably list them eventually. But no matter what, I love their colorful, plump little fingers. 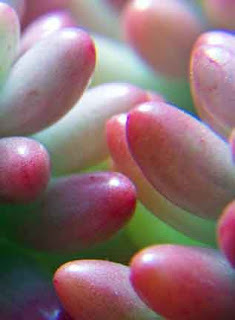 The normal form of this plant is sometimes called "Pork & Beans"; no Pork and Beans here! 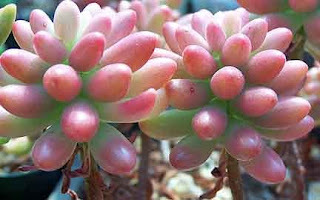 These are called "Jelly Beans" by some, but in my humble opinion, none of the "common" names do them justice. Again, it's time for the magnifying glass. These aren't expensive rarities, but they can give as much enjoyment as the most expensive and rare plant. Today, a real change of pace. Actually, she doesn't pace...just a nice smooth gait. This is our Paso Fino, Jardinera de Omega. Lynn-Marie's the rider. Yes, we have another horse other than "Ladybug", but unlike Ladybug, Jardinera doesn't get to stay at our house or, on occasion, come into the house. 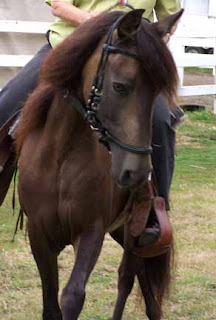 She lives at the stables about 7 miles from us. This isn't an unusual aloe, but it's a lovely, easy to grow aloe - Aloe sinkatana. I understand it's hardy in the San Francisco Bay area of California but I've had no indication that's it's truly cold hardy in our area of the Pacific Northwest of the United States. And if it can withstand our cold, it would need excellent drainage to survive our wet winters. Nevertheless, I may try one this winter to check it out. But even if that doesn't work out, it's still a nice pot subject and well worth growing. Another Haworthia: This one is a small growing plant, Haworthia chloracantha. Almost looks like something from another planet. Of course, not having been to another planet, I can't be sure. Over the years we developed a collection of various crested and monstrose plants and these silver haired "old men" are among my favorites. Maybe it's not a convention, just a coffee klatch. 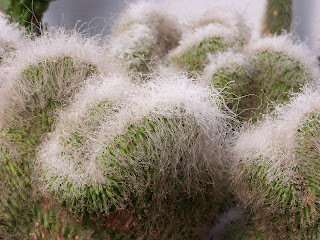 Yes, they're grafted plants of Cephalocereus senilis. The grafts were done by Lazlo at Desert Nursery. Ever since we began growing succulent plants some 40 years ago I've been fascinated by these little plants. To me, the flowers are almost an anticlimax to the beauty in their fat little faces. OK, that's getting a little sappy, but you get the point. These plants illustrate the point. Who needs flowers to enjoy plants like these? While Lynn-Marie was capturing the photo of the fish pond, she also caught this image. Yeah, it's stickery, but then it flowers! The next Lithops is one of my favorites - and a favorite of many - Lithops lesliei 'albinica'. Get a bunch of these together and wow -- what a show! It's been one of those days. Getting ready for company coming from Phoenix, Arizona while at the same time enjoying the late summer early Fall weather we often get here in Portland. Generally at this time of year it's in the 70's and 80's with mostly sunny skies. But we do get the occasional Pacific Ocean storm through to cool things off. Tomorrow and Saturday we should approach 90 F.
With this image I'll end my series on Haworthias. These are, of course, H. truncatas - specifically Haworthia truncata from GM313 seed. I think I'll head on over to the Lithops next, or just something which catches my fancy. We'll see. This Haworthia isn't that uncommon. It's known simply as Haworthia 'Grey Ghost'. When it gets to the species name, it's often identified as Haworthia retusa 'Grey Ghost', but retusa has been changed to H. magnifica var. acuminata by Bayer, which would make it H. magnifica var. acuminata 'Grey Ghost'. Confused yet? Don't be. The naming of Haworthias is still very much in transition (as all botanical naming always is), and certainly at this point, they're all synonyms and can all equally be used. Individual plants can vary a lot depending on the care they've received, especially the amount of light. It may not be all that uncommon, but it can be a very impressive plant with it's whitish-gray variegation. Haworthia mantelii is a hybrid of unknown origin, though it is suggested that it is a cross of H. truncata and H. cuspidata, with "cuspidata" not likely to be a legitimate species as well. As a result the "species" name should be in single quotes. Regardless of it's origin, its a vigorous and impressive plant. This Haworthia cymbiformis isn't quite as lacking in chlorophyll as the one in the last post, but in many ways is just as striking. Today's Haworthia: a highly variegated Haworthia cymbiformis.. With an adequate supply of green and white leaves around the edges, the yellow part of the plant is able to remain strong and healthy looking, making for one stunning oddity. A little change up tonight. We'll get back to a couple of more Haworthias yet, but for now a lovely natural cultivar of Echeveria nodulosa with more accented markings and larger size than the normal version. E. nodulosa 'Painted Beauty' is another of those lovely plants at any distance, but absolutely outstanding in the close-up lens! Tomorrow is Labor Day in the U.S., but I'll still be posting. Hope you drop in. We live just three city blocks from the University of Portland (a private university on a bluff overlooking the Willamette River) and the Fall classes just began this past week. U of P is a big soccer (football to the rest of you) school, national contenders every year, but all Ladybug has to wear to celebrate the new school year is a baseball cap. Oh well, you can't have everything! And they don't have soccer shirts that fit Ladybug. If you weren't aware, Ladybug is our miniature horse who lives with us in town, along with our two Tervuren dogs, a calico cat and a sometimes overwhelming mass of cacti and succulents. Unfortunately, we haven't been able to teach Ladybug to transplant succulent plants, but she's a part of the family, so we keep her anyway! This is a close-up of a seedling, but I love these little plants. Another cultivar, a classic hybrid developed by Harry Johnson - appropriately named 'Harry Johnson'. (Actually, we have three very different Haworthias which we originally purchased from Johnson's Cactus Nursery many years ago with this name. They're labeled 'Harry Johnson I, II, & III) This one is III and we find it to still be very popular. A closeup view. The colors, of course, are best with strong light. I'll be finishing off my series on Haworthias this week, especially adding some hybrids. Then maybe next week I'll start on Echeverias? Though it was thought to be for a long time, Haworthia baccata isn't really a species at all. But since it's in the trade the species name is now 'Baccata', but it's still worth having in a collection. It can be quite stunning.